Designed for general commercial and industrial markets to measure air, water, oil, gas or any medium not corrosive to brass. 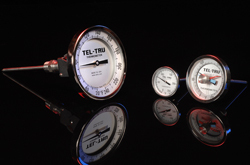 Tel-Tru Metal Case Utility Gauges are designed for general commercial and industrial markets to measure air, water, oil, gas or any medium not corrosive to brass. Dial Size: 1-1/2", 2", 2-1/2" or 3-1/2"
NOTE: Those items featured below are Tel-Tru&apos;s most popular metal case utility gauges, most which are stocked in our inventory. 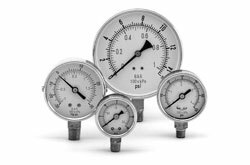 Other models/options are available, please review our Pressure Gauge catalog or consult the factory. Metal Case Utility Pressure Gauge Model 50, 1-1/2" dial, 1/8" NPT, center back conn.
Metal Case Utility Pressure Gauge Model 50, 1-1/2" dial, 1/8" NPT, lower conn.
Metal Case Utility Pressure Gauge Model 50, 2" dial, 1/4" NPT, center back conn.
Metal Case Utility Pressure Gauge Model 50, 2" dial, 1/4" NPT, lower conn.
Metal Case Utility Pressure Gauge Model 50, 2" dial, 1/8" NPT, center back conn.
Metal Case Utility Pressure Gauge Model 50, 2" dial, 1/8" NPT, lower conn.
Metal Case Utility Pressure Gauge Model 50, 2-1/2" dial, 1/4" NPT, center back conn.
Metal Case Utility Pressure Gauge Model 50, 2-1/2" dial, 1/4" NPT, lower conn.